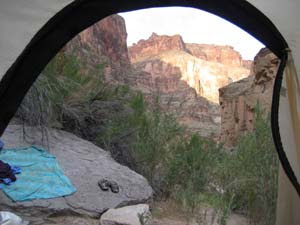 GOING ON ADVENTURES: What is camping like in the Grand Canyon? 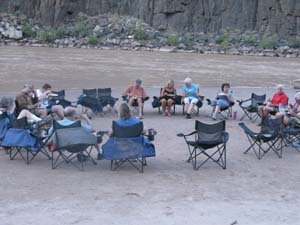 Rafting on the Colorado River in the Grand Canyon means camping out in the open every night. 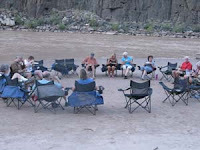 Many people have asked what that’s like on a 10-day trip such as the one we took in September with Arizona Raft Adventures, so here’s a quick overview. ﻿﻿﻿﻿﻿﻿﻿﻿ First of all, be assured that the Grand Canyon is so amazing that it’s worth any inconveniences. The scenery is outstanding and constantly changing; if you take time prior to the trip (or during by reading the provided guide) to learn a bit about the geology, you’ll have an even greater appreciation of what two million years of wind, water, and internal heat can create. ﻿ Sunrise (yes, you’ll be awake) and sunset are both incredible sights--watching shadows creep over canyon walls. Stars shine brightly at night, and shooting stars are a common occurrence. Camp fires are not permitted, so when it gets dark, everyone goes to their tents (gotta have a headlamp or flashlight). 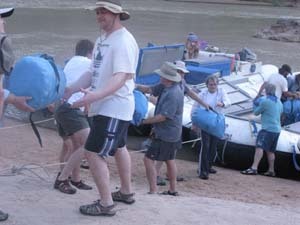 At the end of each day when the guides have decided where to stop, everyone in the group pitches in to help unload the rafts. We formed lines to hand off our blue bags (personal waterproof bags that contained everything we’d brought), folding chairs for our friendship circles, tents, pads, and sleeping kits, kitchen supplies and toilets (one pot for each thing you do). ﻿﻿﻿﻿ The bathroom or “groover” was set up in a discreet spot but often required navigating through sand, rocks, or shrubs to get there. It usually had a lovely view of the river, so we waved if another raft came by while using the facilities. Unlike some camping situations, you can’t go behind a bush. 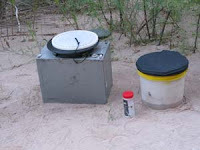 All urine goes in the river during the day, but you can use the pee pot when in camp. Solid waste must be carried out, as is all garbage. Hand-washing is mandatory, with a station always nearby. While we set up our personal camping spots, the guides set up the kitchen area containing pots, plates, and utensils, a stove table and prep table, and a dish washing line. Water from the river was filtered and Clorox added to kill any viruses (no one got sick, so it works). 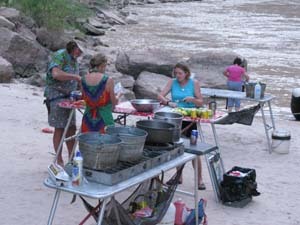 Although meal preparation was a task for the guides, guests were encouraged to help. And the meals were really delicious—not dehydrated camp food, but gourmet meals like steaks, pork chops, and salmon plus fresh salads, fruits, and vegetables. Campsites in the Grand Canyon are primitive, usually sandy beaches with plenty of natural beauty all around. Speaking of sand—it’s everywhere. Once you’ve found your personal camp area and set up your tent, you won’t want to get inside unless absolutely necessary, or you’ll be sleeping in sand. Rocks are everywhere. Big rocks, toe-stumblers, and boulders. Only one night did we camp on pure rock—at Ledges Campsite—and there were no soft spots to be found. Each person was assigned a life jacket that we strapped onto a tree each evening (to keep from blowing away). Wet clothing was strung out on large rocks or tree limbs to dry. Some brave folks actually bathed in the 45 degree water, at least until it turned muddy on day three. ﻿ Early each morning (usually around 5:15 a.m.) the conch shell horn signaled that coffee was ready—time to rise and shine. Breakfast followed, and then we broke camp and began the process of repacking the boats. Again we formed a line to ferry items back onto the rafts. Then we filled water bottles, loaded our white dry bags with things we wanted access to during the day such as cameras and hiking shoes, and put on our life jackets and hats. We were on the river between 7:30 and 8:00 a.m. ready to tackle more rapids and hike to scenic waterfalls. Each day brought wonderful new adventures, many quite challenging. But it’s a trip you’ll look back on with fond memories and pride in your accomplishments.